Recently, we visited the Church of the Holy Sephulcre in Jerusalem. Standing under the central dome, my wife commented that the place did nothing for her faith, and she asked me how I viewed it. I can understand her perspective; centuries of tradition had overlaid the unadorned events of Christ’s passion with gold leaf. My wife was also mindful of the shameful fistfights that periodically break out amongst the priests and monks who share the church, usually because someone moved a chair, or left a door open. Even so, if I were to sum up my feelings towards the tawdry hag of the edifice, it would be something not far removed from love. This might come as a bit of a shock to those who desire (probably rightly) to strip back the accumulation of tradition so that they can behold the un-guilded Jesus of the Gospels, but what I see in it is an allegory of the True Church – the spiritual building that God has built in the life of the community of believers. Just like the Christian community, the building is in parts beautiful, in parts dilapidated; in parts light and airy, and in parts dark and oppressive. Some of its limbs are blind alleys, like the Chapel of the Invention of the Cross, and there are some corners that seem forever locked away. What explanations there are, are written in foreign language (for us English monolinguals), which is an alarmingly accurate parallel to how the True Church must appear to the uninitiated. By far the most enchanting example is the story of the immovable ladder. It appears that some time before 1852, someone put up a wooden stepladder against one of the windows over the entrance, possibly to give it a bit of a clean. Unfortunately for the ladder’s owner, it was up there when the current Status Quo was enforced by the City Authorities, in which the custody of the church building was primarily assigned to the joint care of the Eastern Orthodox, Armenian Apostolic, and Roman Catholic Churches. Doors and window ledges were deemed common ground and, to this day, no one has dared remove the ladder for fear of offending one of the other joint owners. How many of our modern traditions are still in place for exactly the same reasons? Like the Church of the Holy Sephulcre, we have all overlaid our cultural expressions on the Gospel. My own faith tradition is rather Spartan and cerebral; we don’t like bells and smells and we tend to shun ritual. One of our particular failings, of which I’m becoming acutely aware, is that we have almost no idea of community, and no clue about how to create or sustain one. So, this is how I (and we) tend to view Jesus – as a plainly clad, solitary ascetic, who feels at home in the desert and concerns himself with deep theological meditations. I think there is an aspect of Jesus that fits that description, but I miss the aspects that don’t. The picture that emerges from the Gospels is that though Jesus was radically different, he was still embedded in his community, and that means he would have joined in with the community life of a first century Jewish peasant, including weddings, funerals, festivals, and all the cultural expressions that came with them. Jesus was circumcised, and observed the rites; if he had not been he would not have had the free access to the Temple that the Gospels describe. My vision of Jesus as the lonely theologian is sadly skewed. My point is that it seems unfair to accuse others of overlaying their cultural expressions onto the image of Jesus, when I (and we) subconsciously do the same. In any case, why deny the Orthodox or Catholics an expression of Christ within their own cultural vernacular, including the bells, smells and gold leaf? As in all things, I don’t think we have to embrace the whole to receive the good, and I think there is much good in these traditions that would benefit me in my devotions. 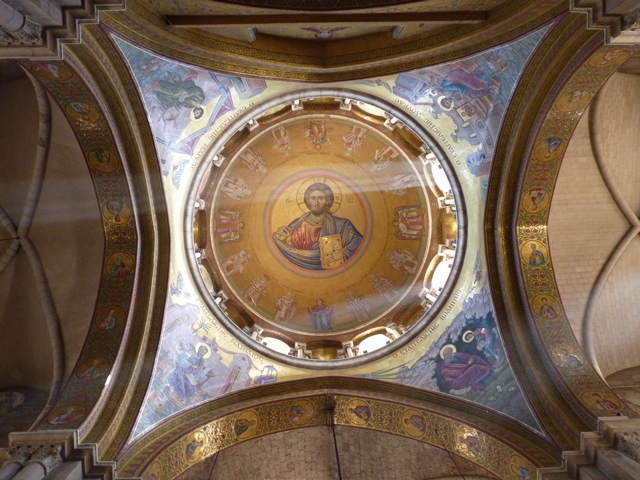 As I looked up into the central dome of the Church, I came to another realization. Say what you will about whether the Church’s cultural overlays had obscured Christ, but the fact remained that he was still there. In fact, he was there in the highest place, gazing down from the apex of the dome, so high that you almost had to break your neck to see it. Below him were the twelve apostles, and beneath them, set into the apexes of the four arches that supported the dome were the titles of the four Gospels – Matthew, Mark, Luke and John. The community of Christians might not be united in everything it does, but it unites under the image of Christ, and under the scriptures that we now call the Gospels. What disunity there is amongst us usually comes from a perceived threat to this image, not because we want to supplant this image with something else. If the image of Christ, and the message of the Gospels give shape to the heavens above us, then the Church of the Holy Sephulcre also gives meaning to the ground below. For, as far as we can tell from the archaeological record, these were the very stones that Jesus walked on as he went to the cross. I don’t know, and I don’t think anyone can tell for sure if this was the exact spot where his cross was posted into the ground, or if his lifeless body was prepared for burial on that exact stone slab, or if that tiny cave was the actual site of his burial and resurrection. But I believe that these stones, or stones like them, are the silent witness to these events. The crucial thing for me is that the message of the Gospels is not some theoretical philosophy that has perpetuated through the centuries because it sounds like a good idea. It is something that is grounded in real events, and in real time, even if subsequent generations (especially mine) have struggled to interpret it within their own cultural context. So, like the Church of the Holy Sephulchre, what I see is Christ himself in his Passion, seen and interpreted by the diverse peoples of the world and celebrated through their own cultures and traditions. The overlays are undeniable, but what is more undeniable is that they all emanate and radiate from this One Man and the one Gospel that He inspired. You could, conceivably, remove the tradition from Christ just as you could demolish the building (which is not something that I would recommend). However, the Gospel will remain and perhaps even inspire a new structure with dimensions and decorative overlays that we could scarcely visualize. What you cannot do is remove Christ. It would be like trying to remove the foundations from under the building and expect it to remain undamaged – the traditions are built on Christ, not the other way round. Skeptics may point to the disunity in the shabby, old edifice that we call the Church as evidence of its failure to connect to God. To an extent, they are right. Too often we have broken out in fistfights over apparent trivialities. However, the Church of the Holy Sephulchre reminds me that, whatever cultural tradition we Christians come from, Christ is beneath our feet and over our heads, and it is ours to live and worship in the space between.